Sponsors: South Carolina Democratic Party, MSNBC, and South Carolina State University. Moderator: “NBC Nightly News” Anchor Brian Williams. Additionally WIS-TV's David Stanton asked a few questions submitted by e-mail. Audience: "All 800 tickets for the MLK Theatre have been allocated to SC State students, alumni and supporters, the eight presidential campaigns, as well as a limited number of South Carolina Democratic elected officials and Party leaders." Broadcast: Live on MSNBC News and live streaming on MSNBC.com. South Carolina NBC affiliates, WIS-TV in Columbia, WYFF-TV in Greenville, and WCBD-TV in Charleston, will join MSNBC in airing the debate. 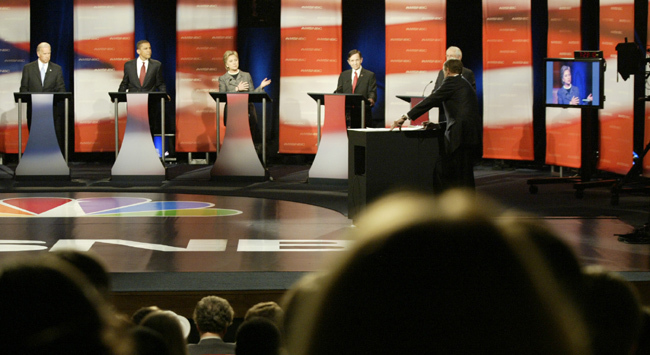 South Carolina Educational Television (SC ETV) will also air the debate live statewide. Format: No opening or closing statements. Candidates had one minute to respond and 30 seconds for a rebuttal at the moderator's discretion. Candidates could not ask questions of other candidates. Background: The debate kicked off the South Carolina Democratic Party’s historic Path to the Presidency weekend, which also included the State Party’s Jefferson-Jackson Dinner, Congressman Clyburn’s World-Famous Fish Fry, and the State Democratic Party Convention on Saturday, April 28 (all in Columbia). -According to MSNBC 2.2 million people watched the debate live on their network. That figure is high for cable and does not include the NBC affiliates or SC ETV. -The questions and time favored the leading candidates, prompting Sen. Gravel to comment at one point, "I was beginning to feel like a potted plant standing over here." -Sen. Biden earned the biggest laugh of the night for his one word response to Brian Williams' question on his verbosity and propensity to gaffes. Asked "Can you reassure voters in this country that you would have the discipline you would need on the world stage, Senator?" Biden said simply, "Yes." -Sen. Gravel, unfamiliar to many, came across as a bit of a loose cannon.